Tangerines! That’s the first thing I thought of when I sipped this rose that look more orange than pink. I’ve been on a rose kick since I had the La Ferme Julien Rose and decided to order a glass of this sucker after waiting in a very long line at a pizza place that was having a Pi Day deal ($3.14 for a pizza) only to get out of line in frustration and hunger and go to a fancy Neopolitan pizza joint across the street. I had this lovely pizza with mascarpone, mozzarella, roasted fennel and onions. Yum! I also had a glass of the 2012 Planeta Syrah/Nero d’Avola. Now this is a blend of Syrah, which is a varietal you probably recognize, and Nero d’Avola, a varietal I had no clue existed. 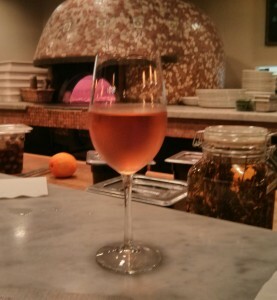 This orangey wine, due to its citrus flavors, reminded me of brunch. It’s tart and slightly tingly from the acidity. After it warms up a bit, it makes your tongue want to rub up against the roof of your mouth because of the lingering flavor, kind of like a dog licking peanut butter off a spoon. When to drink: I imagine drinking this during a summer lunch featuring lots of Italian antipasti dishes at a garden cafe–in Sicily preferentially–but your hometown will do.